When will my parakeet let me pet him? I saw this question posed recently in a social media group and it made me wonder how many new or prospective budgie owners think they are going to have a snugly cuddly relationship with their parakeet. I’m not saying it never happens; we’ve all seen videos of a parakeet lying down in someone’s hand enjoying a neck and head rub and looking like they are in total ecstasy. Much like the budgies with insane vocabularies (Disco, for example) those cases of the snugly parakeet are the exception and not the rule. Here’s the thing though, that’s okay. It simply isn’t natural for a parakeet to want to be petted, it’s great if you adopt the rare parakeet that does, or if you hand raise a parakeet and he grows up feeling comfortable with your touch, but if you have the average budgie that isn’t very snugly, that’s okay too, and it doesn’t mean you have failed at having a good relationship with your parakeet. An additional factor is that similar to dogs and cats, each parakeet has his own personality and overall ability to be tamed. I had a cat once who loved having her tummy rubbed, and another cat who would take your hand off for even suggesting it. Our Petsmart bird Toby was way more comfortable with people and hands after living with us for 6 months than Kelly is, and Kelly was hand-raised by expert bird breeders who handled her every day. Most parakeets that start out feral will become comfortable with perching on your hands, shoulders, head etc. (with a lot of hard work on your part). They will be happy to play with you and preen you. Fewer than that will be okay with you lightly rubbing their necks and heads. Even fewer than that will accept more touching. I’ve posted before about the theory that a parakeet regards your hands as other birds, having nothing to do with your head. From that perspective it makes a lot of sense that they would never accept being petted, since why would one bird pet another? A further complication is that you can accidentally stimulate your parakeet sexually by touching his back, since that’s something they associate with mating. 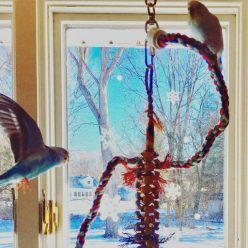 Not surprisingly, it can be very frustrating for a bird to be stimulated in that way without having a mate, and unless you are trying to breed parakeets you don’t want them to be in season anyway. 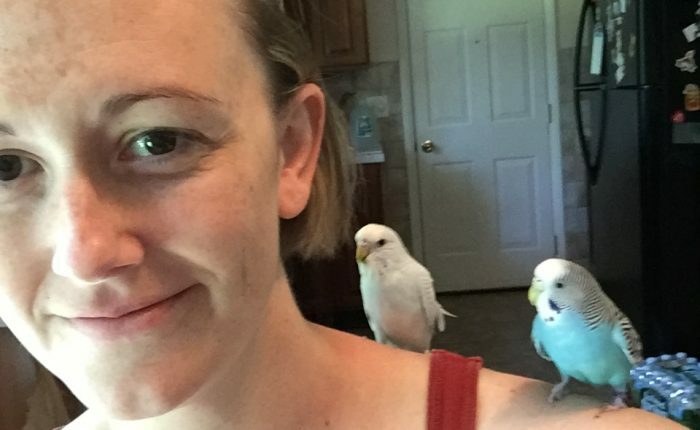 You can still have a fulfilling relationship with your parakeet if he does not fit into your definition of “tame”, and lack of being able to cuddle him does not constitute a failure on your part. Thank you so much for this post. I am starting to be really frustrated with people in Facebook groups who think their birds will be time if they own it for a week or two without putting in any work. This morning someone asked why his bird still wasn’t tame. Turns out budgie does come and sit on his hand when offered millet which I think is a great first step. What this person didn’t understand was that he now needs to spend time teaching and training the bird to do what he wants- and even that isn’t a guarantee he ever will. Makes me so sad for some budgies who end up spending their life inside a cage because they don’t want to be pet like a dog. Previous Previous post: What’s up with the flock?